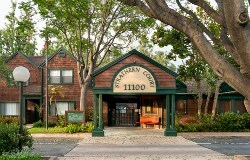 Strathern Court is a 93-unit, project-based Section 8 property located in Sun Valley, CA. The waiting list is currently closed. The property is comprised of two and three bedroom town-homes and five two bedroom flats specially designed for wheelchair handicapped individuals. Strathern Court is close to shopping, a new public library and a park/recreation center that offers programs for all ages and a community pool which is open in the summer months. Each apartment includes a kitchen with range and oven, refrigerator, garbage disposal, central heating and air, wall-to-wall carpeting, vertical blinds throughout, vinyl flooring, private patios and smoke detectors. Access to the building is controlled through an entry gate system and gated resident parking is provided. Strathern Court's common areas include beautifully landscaped grounds with two park-like play areas, two full-size basketball courts, three separate picnic areas (one with built-in barbecues), laundry facilities, a community room with game tables, a computer center, exercise area, and a large screen television. Regularly scheduled activities include movie nights, Polynesian dance classes, game nights, and monthly birthday parties and socials.